Eric Bergman is policy director for Colorado Counties, Incorporated. He works on a wide number of legislative policy issues, including: elections, open records, county powers, transportation, telecommunications and broadband service, and marijuana regulation. Eric holds a Bachelor of Arts in Philosophy from the University of Colorado at Boulder and a Master’s in Environmental Studies from The Evergreen State College in Olympia, Washington. 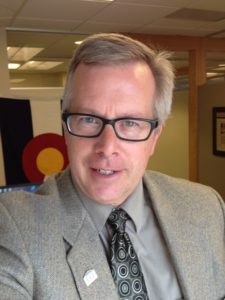 He has over twenty years of experience working with local governments, including serving as director of the Office of Smart Growth in the Colorado Department of Local Affairs. He lives in Westminster, Colorado, with his wife, Sandra, and their two sons, Cole and Porter.